Everyone's mad at Lily and for good reason. Serena couldn’t find the judge to get Ben's conviction thrown out. Chuck can't find Jack to help block the sale of the company. Nate is babysitting his paroled dad. Dan and Blair don't know what to make of Dan and Blair but are acting very awkward about it. Eric just hates his mom too. Why not? Rufus and Lily try to smooth things over with Serena, Dan and Eric. Doesn't work. Lily calls the judge Serena was looking for and tells him he can come back from hiding. Chuck looks to Bart's old associate Russell Thorpe for help, but he says he's not the buyer. Lily says she only brokered the deal because Bass is going down hard. Chuck assumed - and Lily lied through omission - that Thorpe was the buyer. He's not. Yet. Just as Chuck and S prepare to slam L into backing off by blackmailing her with the affidavit she forged to send Ben to jail, they realize they actually have Dan's resume. Dan, now carrying the affidavit in an identical-looking folder, misses an interview because he was waiting for Serena for the 200th time. Dude is getting kind of pathetic. The Bass buyer is scared off by this family drama and Thorpe steps in to buy it after all - with none other than Nate's dad. He's been out on parole, living with Nate. Nate's dad had appeared rather lazy and shady all episode prior to this. Meanwhile, Blair, scheming to become the right-hand woman of Indra Nooyi, is trying to con her own mom into letting her style this high-powered new client. 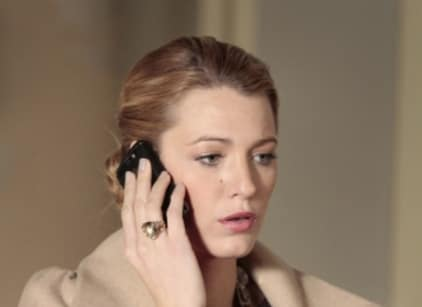 The episode ends with Dan and Blair going to another movie, while Serena heads to visit Ben in jail only to discover he’s been set free by the same judge.